We’re looking for energetic, enthusiastic and high quality people to join our seasonal employment team this summer! And, if you like to smile – all the better! 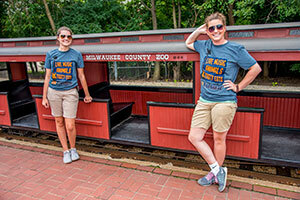 The Milwaukee County Zoo attracts 1.3 million visitors annually, and our seasonal staff adds to the enjoyment of our visitors’ experience at our beautiful zoological park. You must be at least 16 years old to apply for a position.